The planned shake-up of the NHS in England that will put GPs in charge of buying in services could risk patient care, warns a group of influential MPs. The Public Accounts Committee says pushing through the changes while seeking £20bn in efficiency savings may damage front-line services. The concerns follow those of others, including Deputy Prime Minister Nick Clegg's close adviser Norman Lamb. The government insists the overhaul is essential to safeguard services. 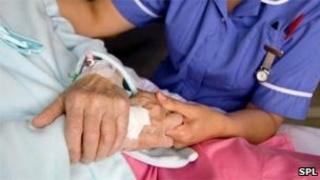 Health secretary Andrew Lansley said: "The efficiency challenge and our reforms are inextricably linked. "Our reforms help the NHS make savings, because getting rid of tiers of bureaucracy will mean an extra £1.7bn each year to reinvest in patient care. "And if we don't give doctors and nurses the power to make decisions for their patients, then quality of care will suffer." Under the plans GPs will be handed control over much of the health budget and the health service will be opened up to greater competition from the private sector. At the same time the government also expects all hospitals in England to become foundation trusts, free from central control. And it wants to secure efficiency gains across the NHS of up to £20bn by the end of the financial year 2014-15 and to reduce administrative costs in non front-line organisations by 33% over the same period. Ministers maintain this is achievable, but the report - House of Commons - National Health Service Landscape Review - by the Public Accounts Committee is less sure. Its report warns that ministers have "no control" over many of the costs. And if the department's estimate of the one-off costs associated with reorganisation turns out to have been too low, it will make the challenge of achieving savings for re-investment even tougher, it says. Committee chairman Margaret Hodge said: "The Department of Health acknowledged the risks associated with this radical shake-up of the NHS. "Whilst the reforms could complement the imperative of achieving £20bn efficiency gains by 2014/15, the reorganisation might also distract those responsible for making the savings while safeguarding standards of patient care." She added: "We were also concerned that the Department has not yet developed a high quality risk management protocol for either the commissioning or providing bodies. "The Department acknowledged that some health trusts and some GP practices had some way to go to achieve foundation trust status or become commissioning consortia. "The Department must have effective systems in place to deal with failure so that whatever happens, the interests of both patients and taxpayers are protected." Dr Hamish Meldrum, Chairman of Council at the British Medical Association, said: "The Public Accounts Committee is right to highlight the risks posed by such a massive restructuring at a time of financial crisis. "However, it is not just the timing, but also the direction of travel of these reforms that will cause problems. "We share the concerns of the PAC that the consequences of increasing competition in the NHS have not been fully addressed. "'Market failures' in healthcare have far more serious consequences than in other industries - and may have little connection with quality of care, or even patient demand." Shadow Health Secretary John Healey said: "As Labour has been warning for some time, David Cameron's plans for the NHS will cause problems for patients services, have serious implications for the future of some hospitals, and make the major health challenges that we're facing as a country much harder to tackle."